7) Asking Others “Kuch Padha Kya”..
10 Doctors, 5 Engineers aur 1 Teacher helicopter ki rassi pe latke hue the. Pilot – Weight zyadaa hai, 1 Aadmi ko rassi choddni padegi! Sabhi Doctors aur Engineers taaliyaan bajaane lage! Weight khud hi kam ho gaya! MORAL: Doctor, bano ya Engineer, GURU toh aakhir GURU hi hota hai. She: Have you brought the grocery? He: Bad command or filename. She: But I told you in the morning! She: What about my new TV? Boy- Dekh – dekh kya dekh?? Usi ko dekh – dekh ke to fail hua hu.. Girl: Didn’t u see the warning ? Engineer: We bother only about errors & not warnings. A heart touching poem by an engineering student……. 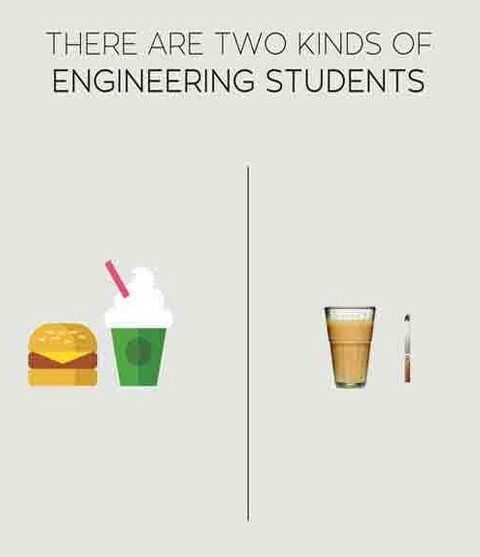 The 2 happiest days in engineering life.. Thank god i got it..
‘kaash 1 din or mil jata, faad deta subject…!! 1. Normal people believe that if it ain’t broke, don’t fix it. 9. An engineer was crossing a road one day, when a frog called out to him and said, “If you kiss me, I’ll turn into a beautiful princess.” He bent over, picked up the frog and put it in his pocket.